The MAFL Team Dashboard for Round 18 is below. Sorry that this is a little late this week. I think I've been mentally recovering from the hiding that MAFL took last weekend. Here's the week's MAFL Team Dashboard. This week I thought we'd take a look at the correlations between team ladder position and the performance statistics in the Scoring Shot Data and Quarter-By-Quarter Performance sections of the Dashboard. The (rank) correlation between Scoring Shots For (measure A) and Ladder Position is +0.75. It would be much higher but for the effect of St Kilda who are 12th on this measure but 2nd on the ladder. The (rank) correlation between Scoring Shots Against (measure B) and Ladder Position is +0.84. The (rank) correlation between the Scoring Shot Differential (measure C) and Ladder Position is +0.98. Creating and preventing scoring shots seem to be of roughly equal importance in generating success so far this season. The (rank) correlation between Own Conversion Rate (measure D) and Ladder Position is +0.72. Collingwood, who are 3rd on the ladder but an astonishing 14th on this measure, drag this correlation down. The Pies could surely have had no better reminder of the importance of converting opportunities than that provided by their 9.22 performance on the weekend, which cost them 2, and almost 4, competition points. The (rank) correlation between Opponents' Conversion Rate (measure E) and Ladder Position is +0.08. The (rank) correlation between Conversion Rate Differential (measure F) and Ladder Position is +0.41. Clearly, this season, success has been far more about converting opportunities than it has been about preventing opponents from doing the same. The (rank) correlation between ranking on Q1 performance and Ladder Position is +0.79. The (rank) correlation between ranking on Q2 performance and Ladder Position is +0.58, dragged down by St Kilda, who are 2nd on the ladder but 14th on Q2 performances, having won just 4 from 12 second terms. The (rank) correlation between ranking on Q4 performance and Ladder Position is +0.65. Two teams have depressed this correlation, Collingwood and Hawthorn, the former being 3rd on the ladder but 11th on Q4 performances, and the latter being 8th on the ladder but 16th on Q4 performances. Unusually, it's been Q1 performances that have been most indicative of a game's outcome this season. Winning teams have won first quarters in 71 of the 96 games played so far this season (and they've drawn 2 more), which is higher than any other quarter. To put this in some historical context, last season, winning teams won just 68.9% of games (ignoring draws). This season they've won 75.8% (ignoring the draw). Hawthorn are in the eight at least partly because they've prevented their opponents from converting opportunities in front of goal. They're struggling in the second half of games, particularly in final terms where they have a 1-10 record. St Kilda, Essendon and Fremantle are all allowing their opponents to convert too many of their opportunities. Essendon's struggles in first and last terms, Fremantle in third terms, and St Kilda in second terms. Relative to their respective ladder positions, Melbourne and Richmond are ranked highly on opponent conversion rate. Melbourne performs significantly better is third terms. Port Adelaide has mastered the art of the whirlwind finish, winning almost two-thirds of the final terms it's played. This hasn't been enough in 6 games out of 11 however. The Lions continue to pair lousy first halves with stunning second halves. The round just finished provided an excellent example of this, as the Lions were outscored 10 goals to 5 by the Roos in the first half of their game, before kicking 8 goals to 2 in the second half. West Coast performs relatively poorly in second halves. The Bulldogs are the best in the league for second terms. 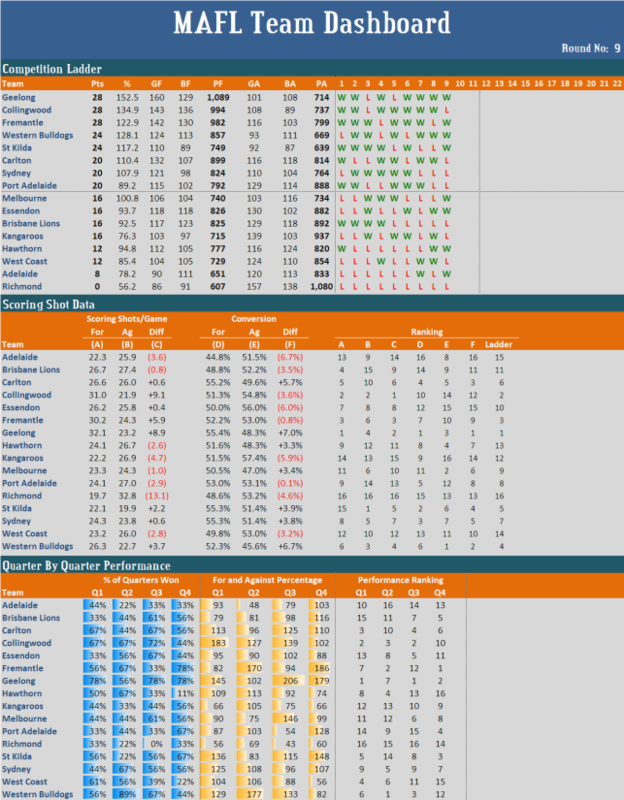 In the previous blog I promised to provide another dashboard, this one devoted to information about team performance. Try as I might, I couldn't come up with any charts for this dashboard that seemed to be of any interest, so the final dashboard is, I admit, something of a festival of text and digits with nary a relieving picture in sight. If Gordon Gecko had been a quant jock, I'm sure he'd have proclaimed that "Charts are for wimps" anyway. The first section of the dashboard provides information similar to that you'll get from a standard competition ladder, but enhances it by providing statistics of Goals For (GF), Behinds For (BF), Goals Against (GA) and Behinds Against (BA), as well as the match-by-match Win-Draw-Loss performance of each team. From this section you can see that Geelong have scored more goals than any other team (they've scored 160), and that Collingwood have scored more behinds than any other team (they've scored 136). You can also see - as I've noted in a previous blog - how remarkable is the performance of St Kilda who, while they occupy fifth spot on the ladder have scored only 110 goals, fewer than any other team in the top eight, but have also allowed only 92 goals, the fewest of any team in the competition. You can also see that only four teams have won their previous two encounters: Geelong (who won their previous four), the Dogs (three), Essendon (two) and Hawthorn (also two). The second section of the Team Dashboard contains information about each team's scoring shot production and those of its opponents'. Here you can see that Geelong have recorded the highest number of scoring shots per game (32.1) and that St Kilda have conceded the fewest per game (19.9). As well, Geelong, narrowly, have the highest conversion rate of scoring shots into goals at 55.4% and that Adelaide have the lowest conversion rate at just 44.8%. In terms of opponents' conversion rates, the Dogs are best. Their opponents have converted at a rate of just 45.6%. Worst on this metric are the Roos, whose opponents have converted 57.4% of scoring shots into goals. The rightmost block of this section provides each team's ranking on the metrics in the columns labelled A through F and, for comparison, each team's ladder position. Here you can see that Collingwood have managed to claw their way into second on the ladder despite having only the tenth best conversion rate and the fourteenth best opponent conversion rate (where a higher ranking relates to a lower conversion rate). Similarly, Freo, who are third on the ladder, have only the seventh best conversion rate and the tenth best opponent conversion rate. A couple of other rankings are interesting. Hawthorn, thirteenth on the ladder, have the eighth best conversion rate and the fourth best opponent conversion rate. What's hurting them is the failure to generate scoring shots: they're ninth on this metric. Also, Melbourne, who are ninth on the ladder, are second on opponent conversion rate. In the final section, labelled Quarter By Quarter Performance, I've included information previously provided under the "Alternative Premierships" designation. It's the only section of the dashboard where I've made a cursory nod to charting proponents, and I can't promise that the charting elements will stay. The leftmost columns of this section provide information about each team's performance by quarter. Here you can see that no team has won a particular quarter in each of its nine matches. The best any team has achieved is an 8 from 9 (89%) record, which is what the Dogs have done in second quarters. In contrast, there is a team that's managed to lose a particular quarter in every game: Richmond in third quarters. 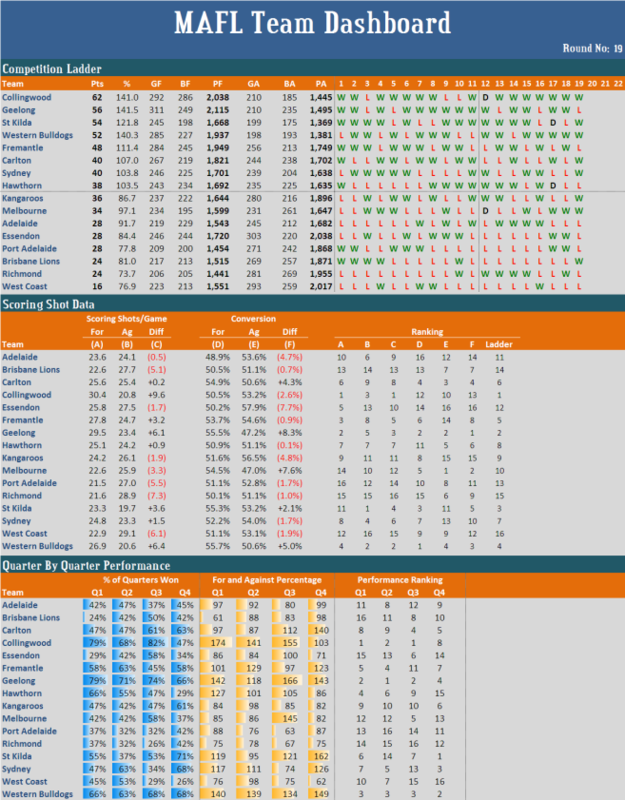 Next in this section is information about each team's for and against performance by quarter. Here you can see that Adelaide have struggled in second quarters in particular, scoring less than one half of the points they've conceded in this quarter, as well as how dominant the Cats have been in every quarter bar the second. These insights are even more obvious if you review the rightmost columns in this section, which provide each team's ranking for each quarter, where ranking is based firstly on quarters won (with drawn quarters counting half) and then on percentage where ties need to be broken. Here too you can see Adelaide's second-quarter weakness and Geelong's first-, third- and fourth-quarter dominance. You can also see Carlton's and St Kilda's relative weakness in second quarters, the Dogs' relative weakness in final terms, as well as the Lions' poor showing in the first two quarters when compared with its performance in the final two quarters, and the Hawks' and Eagles' strong showing in the first two quarters versus those in the final two quarters. I'm sure there's a lot more you can spot too if you study the dashboard for awhile. 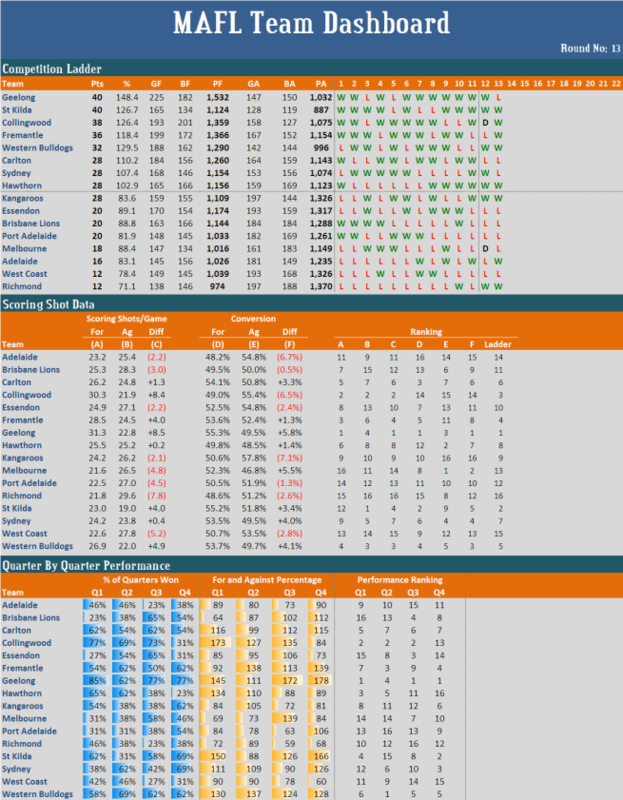 My goal now is to produce this dashboard each Monday or Tuesday night and the MAFL Dashboard each Sunday night. I do hope they provide you with something interesting to review.